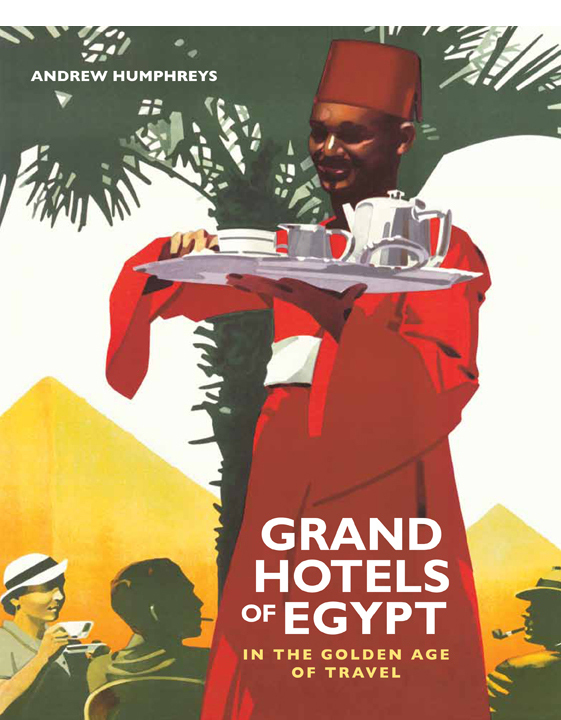 The Grand Hotels of Egypt tells the story of Western visitors to Egypt through the establishments they made their bases – namely the country’s hotels. 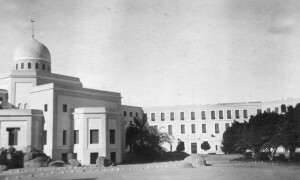 In the earliest times these were resthouses established in the desert to shelter colonial administrators and soldiers enroute to India; a century later, Egypt was a Western playground, entertaining the international rich and titled in a string of opulent Edwardian palace-hotels on the Nile. 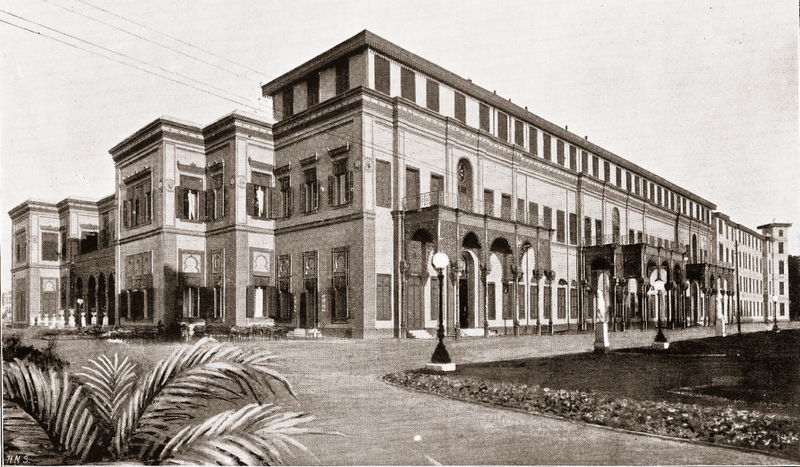 Some of these places still stand, such as the Cecil in Alexandria, Cairo’s Mena House, the Winter Palace in Luxor and Cataract in Aswan; others have passed into legend, notably Shepheard’s of Cairo, which at one time was one of the most famous hotels in the world, even if few have heard of it now. Long before London’s Savoy or the Paris Ritz, Shepheard’s of Cairo was the epitome of glamour. It was a hotel from which explorers set off for Africa, where kings entertained mistresses, where movie stars rubbed shoulders with ofﬁcers on leave from the desert and spies hovered in the hope of minds being softened by the congenial atmosphere. 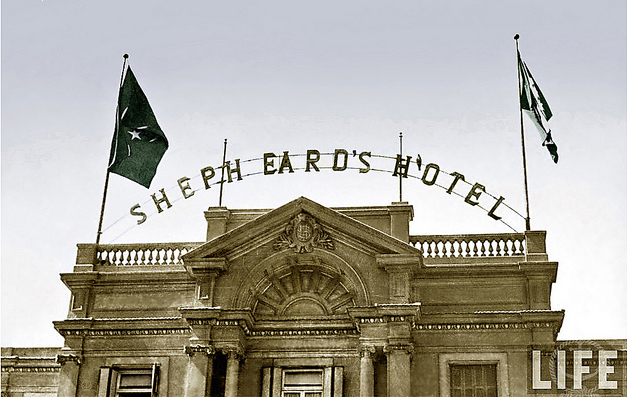 It was one of Egypt’s earliest hotels, founded by a Bulldog of an English merchant seaman named Samuel Shepheard in 1851 (not 1841 as most sources say – a long story and one that is fully explained in Grand Hotels). Everybody stayed at Shepheard’s from Mark Twain and Arabian adventurer Richard Burton to Noel Coward and Josephine Baker. Its parties and balls were legendary, its barmen the souls of discretion. When the hotel was burned to the ground in rioting in 1952, it marked the end of an era. For more stories about Shepheard’s click here. What began as a royal lodge beside the Pyramids before becoming a second home for a wealthy English couple was transformed into a ‘family hotel’ in 1886 – the only family hotel with one of the Seven Wonders of the Ancient World as a neighbour. English author Evelyn Waugh described the hotel as “very enormous & hideously expensive” with a garden full of garish flowers and improbable insects. 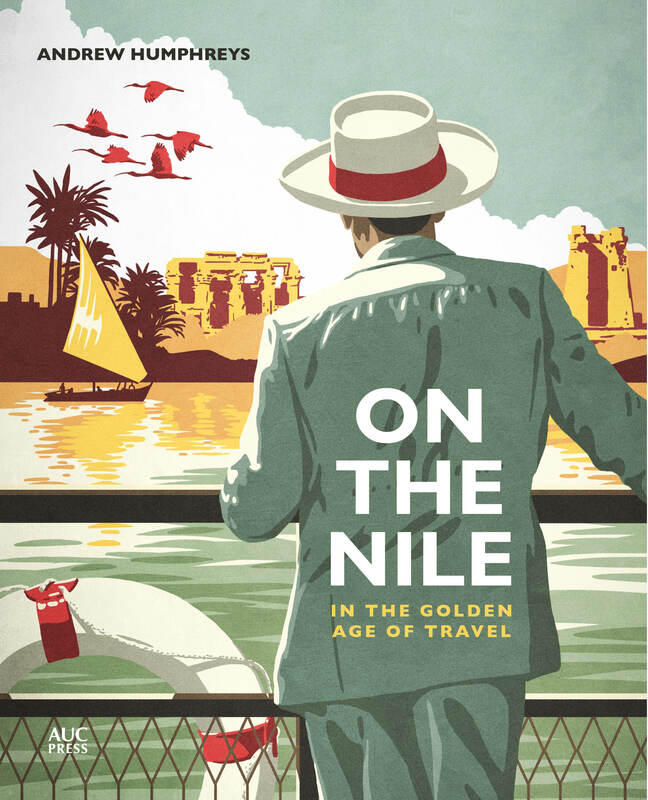 His fellow guests, he wrote, ranged from “amusing Australian trippers with sun helmets & fly whisks to Cairo demi-mondaines in picture frocks – one with a pet monkey in silver harness which sits & fleas its rump on the terrace”. The hotel survives today, even bigger now and still expensive, although Waugh’s terrace, which you can see in the picture above, was lost to an unfortunate refurbishment in the 1970s. For more stories about the Mena House click here. First it was the New Hotel, opened on Cairo’s new Opera Square in 1869, hosting guests in town for the inauguration of the Suez Canal. 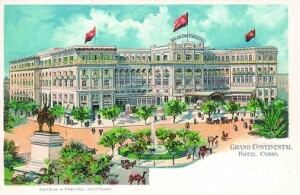 Later it became the Grand Hotel, then the Grand Continental and finally the Continental-Savoy. It was the great rival to Shepheard’s up the street and boasted its own starry array of guests including TE Lawrence, who spent a year living at the hotel. It was also in a room here that Lord Carnarvon died of an infection brought on by a mosquito bite. The building still stands but it is some 30 years or more since the last guest checked out. For more stories about the hotel click here. A genuine palace, the construction of which was hastily completed in order to accommodate the arrival of Empress Eugenie, visiting Egypt as guest of honour at the opening of the Suez Canal in 1869. The architect, Julius Frantz, with not a hint of modesty, decreed the building to be “the most beautiful building of modern Arabic style in its category”. The ﬁrst royal guests, the Prince and Princess of Wales disagreed, describing the place as “uselessly extravagant”. The palace was converted into a hotel in 1894 but closed in 1919. After several decades as a private residence it became a hotel once more in the 1960s, when it was called the Omar Khayyam; it is now the Cairo Marriott. For stories about the hotel click here. 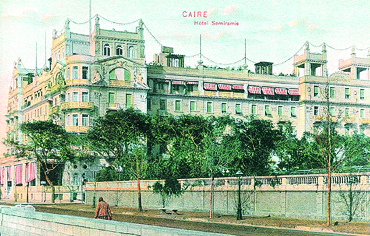 Prior to the Semiramis, most of Cairo’s major hotels were located downtown, on or near the Azbakiya Gardens – the Smeiramis was the first hotel to be built next to the Nile, in 1907. It was the grandest establishment of its day – although it didn’t meet with the approval of all its guests: “Here we live in a marble and bronze hotel,” wrote T.E. Lawrence (of Arabia) to his mother in 1921, “very expensive and luxurious: horrible place: makes me Bolshevik.” The original hotel was demolished in the 1970s to make way for what is now the Semiramis InterContinental. For stories about the hotel click here. 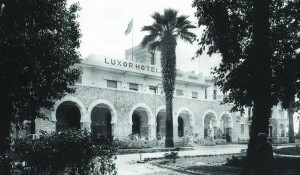 At one time – in 1923, to be specific – Luxor’s Winter Palace was possibly the most famous hotel in the world. The discovery of the sealed tomb of Tutankhamun had captured the imagination of a global audience and the hotel became the newsroom and center of speculation for the most eagerly read story since the end of the Great War. The hotel was opened in 1907 – not 1886, as the current hotel website claims – and survives today largely unchanged since then; if you’ve ever wanted to experience Egypt as the Edwardians might have done (but with added air-con), check in here. For more stories about the hotel click here. This was the first hotel to be built by the company of Thomas Cook & Son anywhere in the world. 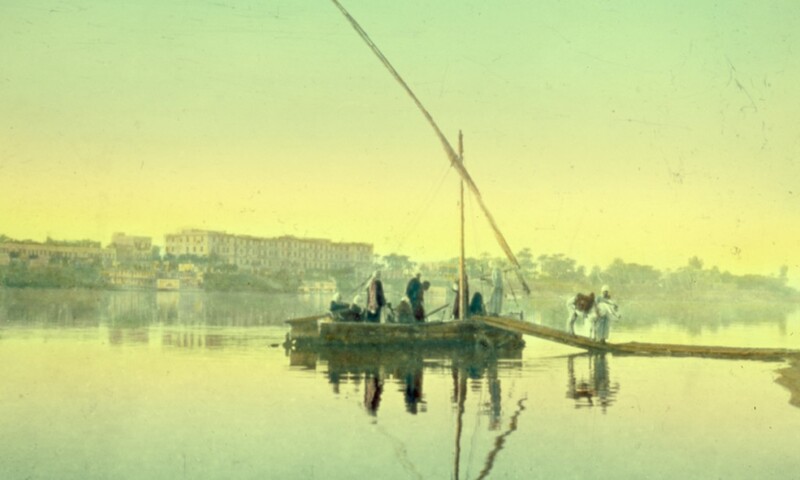 It went up in 1877, just seven years after Thomas Cook first began offering tours to Egypt. Although it was superseded 40 years later by the Winter Palace, the Luxor stayed in business right through into the 1990s. Right now, it is undergoing extensive renovations as the government body responsible for Egypt’s state-run hotels, EGOTH, intends to bring the Luxor back into service. If that happens, the Luxor will be Egypt’s oldest surviving hotel. For more stories about the hotel click here. Opened in 1901, the Cataract was financed by Thomas Cook & Son. The company’s hired architect created stately corridors and lofty salons framed by processions of Moorish horseshoe arches of a kind alien to local Islamic architecture but quite familiar to Westerners from illustrated editions of the tales of Ali Baba and Sindbad—in other words, exactly what Cook’s Nile tourists expected to see on their Egyptian voyages. It remains until today Egypt’s most magnificent hotel. For more stories about the hotel click here. Tremendously exciting website Andrew – cant wait for the book to be out – I will be downtown with maps and a copy, absorbed! Looks fascinating and fun. You made me take a trip today to helwan to look for any remains of the grand hotel there, but I was so disappointed to see what happened in helwan. Saw this in AUC press catalogue, looks very nice, I can’t wait to get it. I am thrilled for you, well done. I was teaching at AUC for the last 2 years. Still living here, teaching at the German University in Cairo now, not quite as grand or rich as AUC but really good for Graphic design and the likes. After acquiring your beautiful book in Egypt this spring, I am currently reading it. Such joy!! Janine, thanks for the kind comment. Hope you’re enjoying the blog too. Hello, this is fantastic research. Well done. Does your book make mention of which hotels had pools in them. It is an obscure detail I’m looking for to trace a statue that apparently came from a hotel with a pool in the 1930’s. I will look into your book. The only Egypt hotel I know to have had a pool in the 1930s was the Mena House. Hi Andrew, this is a great review and it really prove how Egypt evolves their business ways. The hotels seems to be one of their large investment then. We can see the changes from then until today. I’m also reading your book and it is so helpful and informative. Thanks for this. 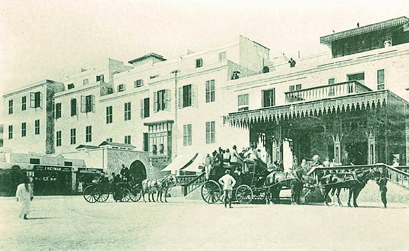 The same hotel appears in the Builder (British Architectural Journal) in 1869. (vol. 27, pp. 926-927). The caption on the perspective view reads: ‘THE NEW HOTEL. CAIRO. EGYPT – Ms Christopher G. Wray, Architect.’ There is also a drawing of plans at two levels. The building has verandahs on the principal facade. In the Builder version, probably published before the building was erected, there is a dome over the central part of the building with fairly elaborate roofs over the end ‘pavilions’ with turrets etc. These do not appear in the Illustrated London News version. At the moment I only have access to the images I photocopied from these articles. I will be able to get the text when I return to Australia in about 3 weeks. If you would like me to attach them to an e-mail I will do so. Any information on this hotel would be much appreciated.